The facade of McSorley’s Old Ale House as it has looked since 1854 in New York City. – – Located at #15 East 7th Street between 2nd & 3rd Avenues near Union Square & Cooper Union. 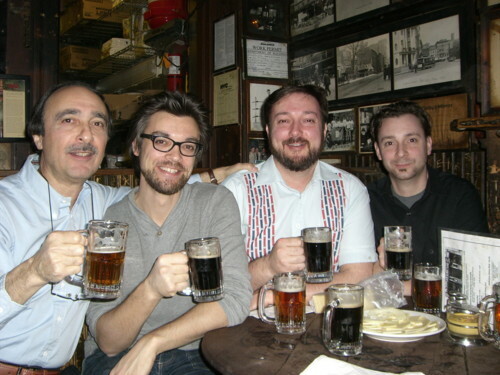 Excuse us for living, but this April 2013 marked my fifth trip with my three sons to the one and only Mc Sorley’s Old Ale House in New York City. We have been doing so every other year since 2004. (Last year’s trip was postponed until now due to #2 son’s one and one-half year work sojourn in London.) To my delight, the “boys” seem almost more enthused than I am with each visit to my old haunt. Actually, I am thrilled too that we have this time together relating in a very unique way. As my sons’ jobs and abodes changed location over the years, so have the details of each trip. 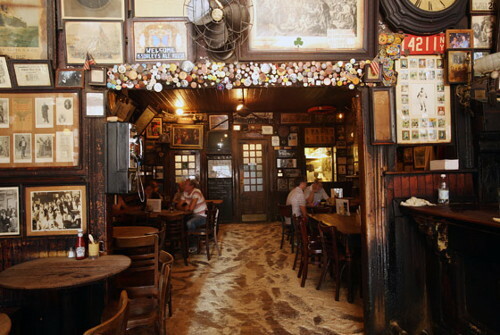 Suffice it to say, we all rendezvous at McSorley’s at 3:00 PM on a Saturday in the spring. The custom of this NYC landmark is to serve 2 mugs of ale, one dark and one light, at the same time to each person as “a round.” No trip is complete without a dish or two of American or Cheddar cheese, crackers, raw onions, and HOT mustard. Now the mustard is so hot, it requires an ale in hand to quickly wash this unique culinary treat down as fast as possible. This routine goes on for anywhere from 6 to 9 rounds. Now that totals 12 to 18 mugs a man! We’re talkin’ some serious beer drinkin’! To everyone’s amusement, an ever so brief mock business meeting of the “Three Sons & A Dad’s Club” is conducted by yours truly according to a loose interpretation of parliamentary procedure a` la Robert’s Rules of Order. Plenty of photographs are taken in the course of our spell at McSorley’s to incriminate all! We always terminate our visit by 5:00 PM. At that time, we take a traditional photo around one of the green barrels placed on the sidewalk outside the storefront. – – Cigars passed around to all concerned! Then, it is off to dinner with wine, of course, at a preordained, with much “research,” Italian restaurant nearby. Such evenings end with retreat, inevitably, to one son’s NYC apartment for an “overnighter” to sleep it off! – – Full diner breakfast Sunday morn & then everyone off on their respective trips back home. 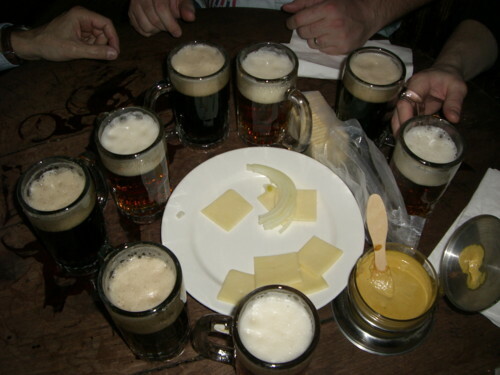 If you don’t try the cheese, crackers, raw onions, & HOT mustard at McSorley’s, you just haven’t been there! It’s part of the experience & what a treat, what fun! 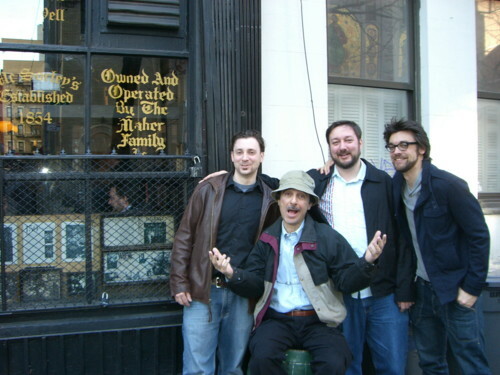 Here we are leaving McSorley’s & taking another traditional photo with me sitting on one of the old barrels out front. Waiter Richard Buggy, known to all who frequent McSorley’s, proudly meets Andy a few years ago. 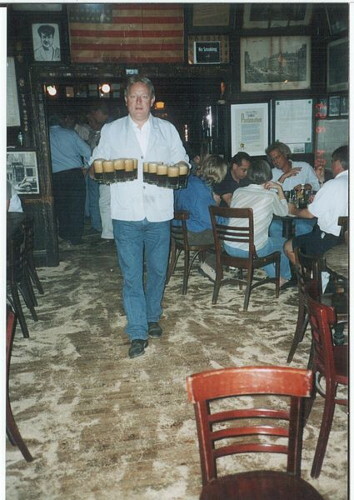 He was waiting tables at McSorley’s going back to my Rutgers years & I knew him then! He retired around 2010. On the wall of McSorley’s is a small newspaper article about Richard Buggy’s regular job as an NYC Police undercover cop in all sorts of disguises! 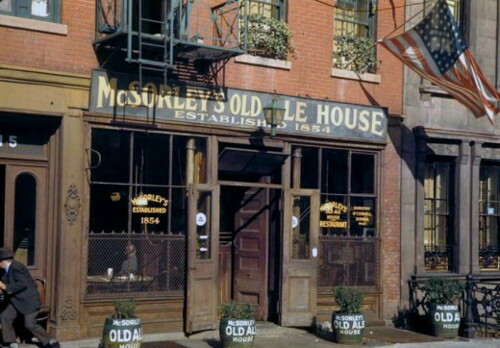 McSorley’s Old Ale House is the oldest Irish tavern in New York City, founded by John McSorley in 1854, just a few years after he arrived from Ireland. It’s “claim to fame” was having been one of the last “Men’s Only” pubs. This practice ended in 1970 when the doors of McSorley’s opened to women as a result of a discrimination case brought to District Court and won. But the establishment took 16 years to add a proper “Ladies Room,” sharing a unisex bathroom with the gents all those years! The memorabilia on the walls is an eclectic collection from art work to newspaper articles, literary pieces, and items dating back in history and politics from photographs to campaign buttons and so much more! 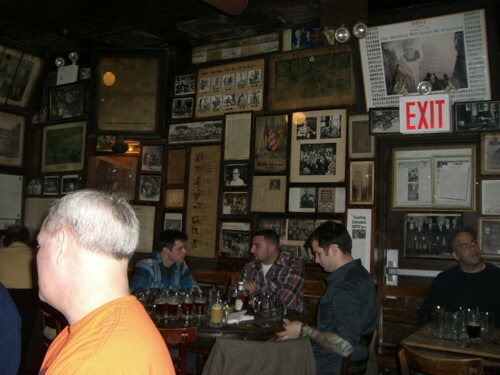 McSorley’s is considered one of New York City’s “top 5 Historic Bars,” located within the East Village/Lower East Side Historic District. 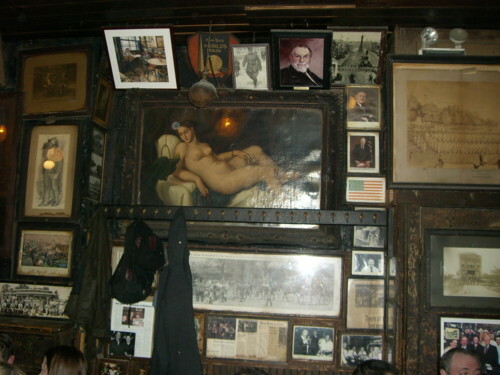 Patrons of McSorley’s go back in history to include Abraham Lincoln, Teddy Roosevelt, Peter Cooper, Woody Guthrie and a long list of literary figures. 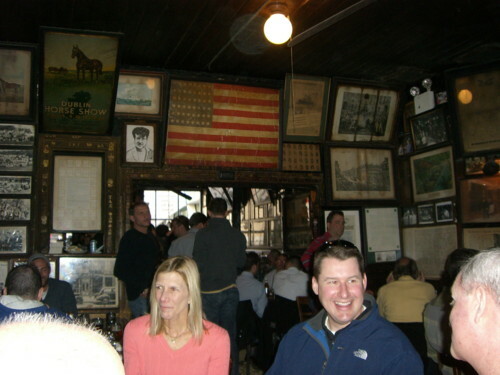 Excuse us for living, but to visit McSorley’s will add much to the “living” and with no need to “excuse”! Comments: Please! This was a real “fun write” with photos…almost as much fun as this last trip! Thanks, guys for trip #5!!! Love these shots and the story! I remember hearing about one of your earlier trips from Peter–this is a wonderful tradition. Nice work, Fontanas! Danielle, Thanks so much for you interest & caring about our exploits!!! Peter spreads the good word about McSorley’s! Yes, I agree re the tradition that grew out of the idea of a neat thing to do with my sons. Fun photos, hey???!!! Sounds like one great tradition in a great place! Philip, I think every college town has its version of McSorley’s. In Boulder, home to University of Colorado, it used to be Tulagi’s but their lights have long ago gone dark. The most famous and iconic dive now (well, it was a smoke-filled dive when I worked there in the 60s – they have since cleaned up the place) is The Sink. On Friday nights and, not surprisedly, during final exam weeks, it took a crowbar to get inside it was so crowded. I met many of my future wives there but after a hot few hot and lurid hours we both changed our minds and went home, separately, in search of aspirin, trying to remember each other’s name and phone number. Oh, well. Even President Obama stopped in for a unique pizza last year. Just a short block from campus, many a student pops in for a cheeseburger and a beer for lunch, or a couple of cool ones on the way home from class, and/or for a study break around 9:00pm. The place has been around since the 20s and was originally called “The Sunken Garden.” Old farts make sure they go by the Sink when in town for reunions or football games, and many of them bring along their kids and grandkids. Ah, the stories that get told. Some are probably true but who cares. Good article. I forwarded it to a friend of mine whose son attended Rutgers. Keep them coming. 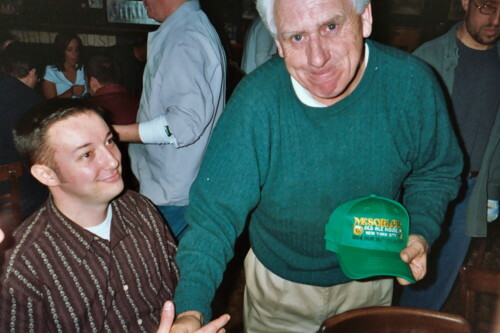 Phil, …….We always have enjoyed the McSorley stories through the years but your choice pics made this one priceless! You captured the moment and the flavor of the establishment of which I could only imagine until now. Glad you were all able to make up for the delay in your annual visit. Great write up capturing history and “the Fontana Boys Family Fun”. Phil, what a terrific tradition you are celebrating with your sons. In a circle of life kind of way, I feel I am there with the four of you now, since I was there with you all the way back in 1965 with the RU Glee Club. You and Geri have been blessed with a family of three wonderful young men. Awesome posting Phil. Looks like fun!! What a lovely, loving tradition to have with your sons. Trust you never stop sharing this special, testosterone-laced time together. :). Does Geri enjoy an annual “my three sons” crafts party with the boys? A lot of times it’s challenging to get that “perfect balance” between usability and visual appeal. I must say that you’ve done a excellent job with this.